The coracoclavicular joint is an uncommon anatomical variant with a diarthrotic synovial joint between the conoid tubercle of the clavicle and the superior surface of the coracoid process . From the previous studies, the prevalence varies between 0.04- 30% and much more high in Asia than in Europe and Africa [2-5]. By the way the coracoclavicular joint does not usually produce any symptom. A 39-year old Thai female presented with her severe right shoulder pain for 5 months, without any traumatic history before. The right shoulder examination revealed full active and passive range of motion. The pain was aggravated when she forward flexion and adduction her shoulder. She can’t able to do any heavy weight lifting due to her painful shoulder. The radiographic examination revealed the presence of an accessory joint between the coracoid and the conoid tubercle (Figure 1). The computerized tomography (Figure 2) and the Magnetic resonance imaging study reveal the presence of a pseudoarthrosis with degenerative diarthrosis between the coracoid and the distal end of the clavicle (Figure 3). 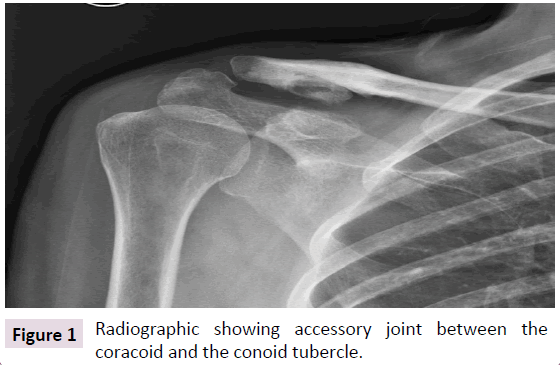 Figure 1: Radiographic showing accessory joint between the coracoid and the conoid tubercle. 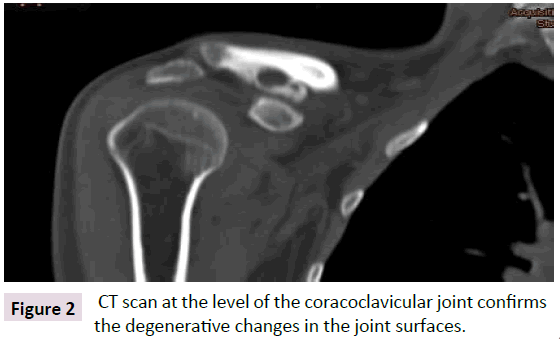 Figure 2: CT scan at the level of the coracoclavicular joint confirms the degenerative changes in the joint surfaces. Figure 3: MRI reveals the presence of a pseudarthrosis between the coracoid and the distal end of the clavicle. The incisional biopsy was done through the pathological lesion and mature hyaline cartilage was reported from the study. The local 2% xylocaine injection test was performed at the coracoclavicular joint to confirm the source of her pain. Dramatic pain relief at her shoulder was noted after xylocaine injection was done. However, the pain was relieved for just only a few hours and the pain was still the same as before the procedure. After we decided to treat the patient initially by non-operative treatment (medication, physiotherapy and local steroid injection), the pain was improved but still disturb her daily life activity. Arthroscopic resection of the coracoclavicular joint was performed in order to improve her life quality by restore her shoulder motion. The procedure was performed in standard beach chair position with a cushion under the scapula of the affected shoulder by under controlled hypotension and a combination of regional and general anaesthesia for better visualization and post-operative recovery. A standard posterior portal was created and the arthroscope was inserted into the glen humeral joint. An anteroinferior portal was created with an outside-in technique through the rotator cuff interval. The anterior capsular structures are resected until the coracoid was well visualized. The anterosuperior portal is then identified and created with a spinal needle at a point just anterior to the anterior margin of the acromion. Then the coracoid and also the coracoclavicular joint can be identified directly after the scope was transferred to the anterosuperior portal (Figure 4). The coracoclavicular joint was resected through the anteroinferior portal by arthroscopic burr (Figure 5). The resection begins laterally and proceeds medially. 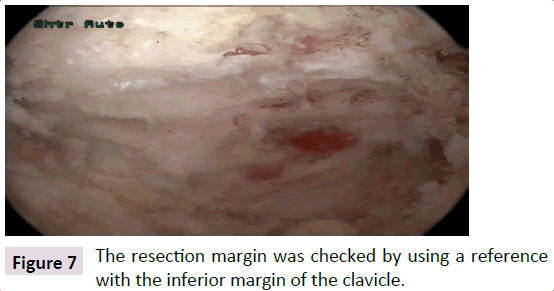 The margin and adequate of coracoclavicular joint resection was checked by using a fluoroscope (Figure 6) and reference with the inferior margin of the clavicle (Figure 7). 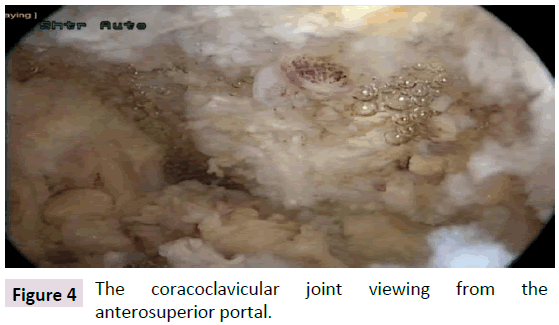 Figure 4: The coracoclavicular joint viewing from the anterosuperior portal. 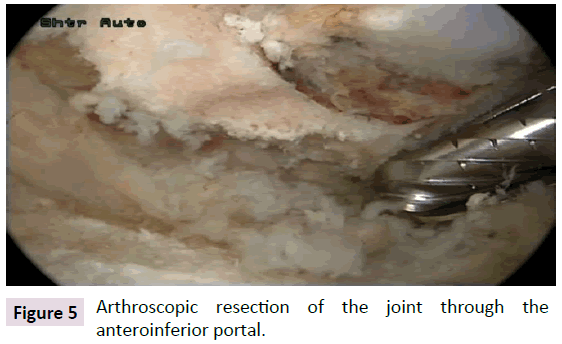 Figure 5: Arthroscopic resection of the joint through the anteroinferior portal. Figure 6: The resection margin was checked by using a fluoroscope with the inferior margin of the clavicle. 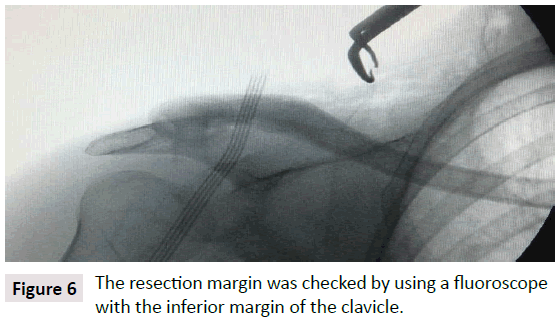 Figure 7: The resection margin was checked by using a reference with the inferior margin of the clavicle. After the operation her arm was placed in a sling for 2 weeks after that she was allowed to begin her active shoulder range of motion exercised. At nine months postoperatively, she regained her full active range of motion with no painful arc of motion at her shoulder at all. No evidence of recurrence or inadequate coracoclavicular joint resection was seen from the postoperative radiographic study anymore (Figure 8). Figure 8: Postoperative radiographic showing no evidence of inadequate or recurrence coracoclavicular joint formation. The acromioclavicular joint was clinically stable with full active range of motion of her shoulder at 18 months postoperatively. There was no prominence, subluxation, or dislocation of the acromioclavicular joint (Figure 9). Figure 9: At 18 months postoperatively. The acromioclavicular joint was stable with full active shoulder motion. A coracoclavicular joint is a rare anatomical entity that is more common in Asians than in other races. From the previous study, the prevalence ranges between 0.7-10% in osteological studies, 1.7-30% in cadaveric dissections and 0.04-3.0% in radiographic studies. But normally these anomalous joint doses not usually produce a painful arch of motion [6,7]. Conservative treatment is still the first-line of treatment. However if conservative treatment was failed, coracoclavicular joint excision is a good surgical option. The excision can perform by both open and arthroscopic technique . In our case, we resected the joint by arthroscopic technique with a good postoperative clinical and radiographic results, no painful arch of motion in just 10 months postoperatively. We recommend arthroscopic excision technique in the patient who need less postoperative recovery time. Gradoyevitch B (1937) Coracoclavicular joint. J Bone Joint Surg 21: 918-920. Cockshott WP (1992) The geography of coracoclavicular joints. Skeletal Radiol21: 225-227. Nehma A, Tricoire JL, Giordano G (2004). Coracoclavicular joints. Reflections upon incidence, pathophysiology and etiology of the different forms. Surg Radiol Anat 26: 33-38. Gumina S, Salvatore M, De Santis R, Orsina L, Postacchini F, et al. 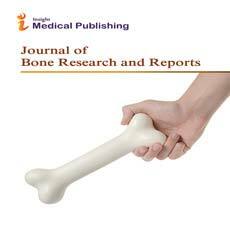 (2002) Coracoclavicular joint: osteologic study of 1020 human clavicles. J Anat 201: 513-519. Nalla S, Asvat R (1995) Incidence of the coracoclavicular joint in South African populations.J Anat186: 645-649. Possati A (1926) Un caso diarticolazione coraco-clavicolare osservato radiograficamente. Chir d Org di movimento10: 533-536. Timpano M (1934) Aspetti radiografici dell’ articolazione coracoclavicolare. Ann di Radiol e Fis Med8: 491-507. Singh VK, Singh PK (2009) Bilateral coracoclavicular joints as a rare cause of bilateral thoracic outlet syndrome and shoulder pain treated successfully by conservative means. Singapore Med J 50: 214-217.